As my work tends to be very unusual and there is a high ‘curiosity value’ around what and how I photograph my subjects, I have presented on several aspects of my photography to a variety of audiences. A look behind the scenes at how I approach my photography, my work processes and how I create some of my images. This is my flagship presentation and in response to the large number of requests after presenting at the PSNZ Southern Regional Convention, I have recorded this for photographic clubs and societies to download and play at clubnights. This is a personal exploration into why I take abstract images, in particular, to what extent my musical background and training has influenced my photography. An introduction to Triptychs and some useful tips on how to create them. How do I download ‘Abstracted Reality’? I am happy to make the presentation available to recognised groups with an interest in the visual arts. Please encourage one of your Club’s officers to contact me and, provided everything checks out, I will send them details on how to access the presentation and resources. The presentation itself is a Windows ‘exe’ file and is just over an hour long. I know how difficult it is to write notes in the dark while a presenter is displaying and talking about their images, so to help your Club members I have also created a nine page handout of the key points. You are free to distribute this handout to your members or, if more convenient, load it on to your Club’s website. • What makes a good Abstract? 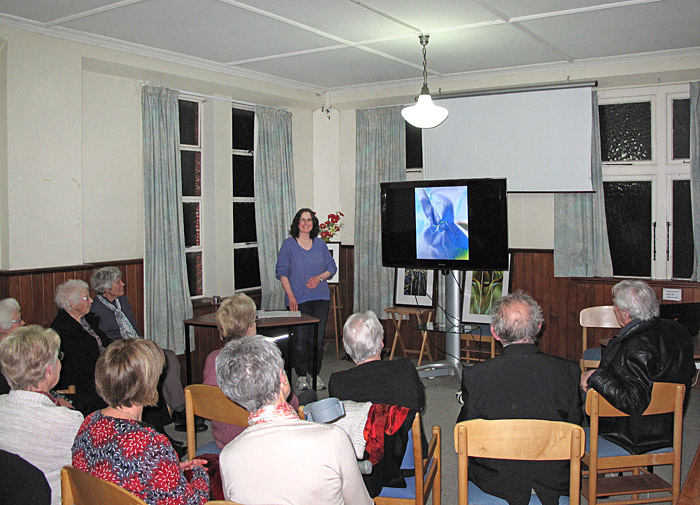 Jane presented a stimulating and thoughtful presentation on digital abstract art. For her, both music and the visual arts offer the same challenges, and create a similar response; even the vocabulary is the same – colour, tone, form, composition and so on. Her passion and dedication for this was infectious, and the images she showed inspired some really lively discussion. Possessing an instinct for recognizing the often rather serendipitous eye of the camera, Jane revealed just how many works of art can be coaxed out of what at first sight can appear to be a very limited environment. All the artist needs is eyes that can see. Thanks for making your wonderful programme available to us. A professional, fascinating presentation, enthusiastically enjoyed! The imaginative and quirky images clearly displayed Jane's talent which parallel her professional ability as a musician and teacher. Continue your adventure into the realms of Abstracted Reality and sign up to my Newsletter.